Looks good. 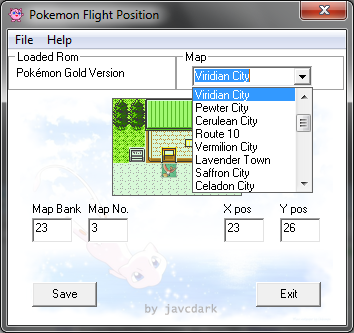 I remeber Goldmap having a flight position editor but I think it caused me too many problems so I deleted it. Although the picture is quite missleading, because it makes you think you can just drag the box instead of changing the x/y values. It would be good for people that aren't comfortable with hex editing yet. I also made a seemingly identical tool back in 2013 but I think I must have only posted it at PHO. Anyway, looks like it will be helpful to people who aren't comfortable with hex editing or aren't using one of the disassemblies. Great work on this! And Mateo, your tool is also great. I will mess around with this and see if I may encounter any strange bugs.